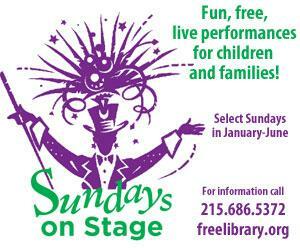 Get ready to rock, roll, dance, and dream this summer as our Sundays on Stage FREE performance series returns this weekend! The Cats put on more than a concert—they plunge the audience into a wild, wonderful world of stories, puppets and props, backed by a band guaranteed to delight all ages. Join Linda Humes and master drummer, Sanga, as they share Caribbean and African diaspora stories. It will take the whole audience to help sort things out as these beloved and often hilarious fables are told with masks, puppets, and a lot of inventive theatricality by the Experiential Theater Company. Chana Rothman will share a collection of songs and activities that give voice to a growing movement towards freedom of gender expression. The Hampstead Stage Company presents the timeless tale of an Italian woodcarver and a marionette on a journey to become a real boy! This fun filled magic program will include a dazzling display of illusions, comedy, and audience participation. Enjoy the grace, tenderness, and sculpturesque poses of the classical Indian dance Bharatanatyam. Professor Horn captures the wonder and pure imagination of childhood with his clever comedy magic, novelty routines, and his laugh-out-loud funny Punch & Judy puppet show. Add a Comment to Sundays on Stage Winter/Spring Calendar of events!